On Monday I pottered around doing my usual things, and Mas went off to Brent Cross to meet up with an acquaintance. I had been listening to the radio on which there was a programme about Delia Derbyshire. She had worked for the BBC Radiophonic Workshop and was responsible for creating lots of weird sounds and music. At the time, on the Third Programme (which became radio 3) they used to put on experimental and avant guarde plays which owed a lot of the atmosphere created to the work by the Radiophonic Workshop. Delia Derbyshire was most famous for realising Ron Grainer's theme tune for the original Dr. Who programmes. Tuesday, and Diane is off to France. Mas spent all day meeting up with various people he is trying to work with. I walked to Edgware, picked up a little shopping and spent time browsing in the library. I began painting Grimsby, a dog character from Pete's book, but after a while I had to see Barry next door so I could look at his dog's feet, to his amusement. I watched a programme called The Genius of Omar Khayyam. I was familiar with his poetry, I knew he was an astronomer but had not realised what an important mathematician he was also a philosopher. It is amazing what some people achieve in a lifetime. This morning Salty bought in a mouse which immediately hid under the sofa. After a lot of cunning tracking I had the mouse backed into a corner (having excluded Salty from the room). I thought I would pick him up and then put him into the garden, hoping I would not be bitten too badly. As soon as I tried this, the mouse ran up my arm with the speed of light, and onto my head. I rushed out into the garden hoping I was still carrying him. Later, Salty seemed to have lost interest in the whole project, so I assumed the mouse had made it into the garden. I went off for a walk, then later finished off the Grimsby painting for Pete. Mas and I spent most of the week doing necessary but uninteresting things, and me going for rather dreary walks whenever I could. One good thing was that Mas went off to the hospital and got fitted with hearing aids. He said that they improved his hearing, and were so comfortable that he forgot he was wearing them, and they were almost invisible. We watched and listened to TV at a very low volume which I really liked. I listened to the last part of the Jacques Brel series that I have been listening to on the radio, and spoke to Diane who is heading off to France soon. Pete came back from Guernsey, and I caught up with his news. On Thursday Tania and Robert came down and we went off to 'the curry club'. We all felt a bit tired, especially Tania who was still suffering from jet lag. Ken arrived and had dinner too before he left to talk to other friends; he is off on holiday soon visiting India for the first time. We did not linger too long, but had a nice evening together. 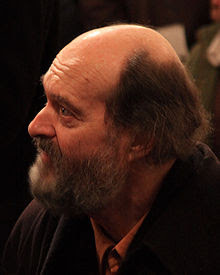 I watched a programme about Sacred Music which included interviews with Arvo Pärt which I found interesting; I think his music is amazing on so many levels. Later we watched 'Lewis', and although we had seen this episode before we still watched it again because it is a good one. On Saturday Mas and I went for a walk to Stanmore, by the time we were there Mas had got the familiar painful tightening in his calves, so he bussed back home. I picked up a couple of things from the shop and walked home again. I tried my hand at painting more peculiar animals for Pete, as illustrations for his Skelly book. I watched an episode of Poldark which were first shown in the 1970s; I had enjoyed them then. We also watched another superb Wallander with Krister Henriksson as the detective. Mas has not been wearing his hearing aids and says he will wear them when necessary! Saturday, and we drove off to St.Albans to get shopping, and meet Robert at Sazios for lunch. Robert had bought me some of the lovely business cards he had made for me, now all I need is the business. It is quite evident that Robert is missing Tania, but thankfully from his point of view she will be coming back tomorrow. The fruit and vegetables in the market seemed rather expensive today, so we did not stock up with much. It still makes Mas laugh to hear all the market traders shouting out their wares for sale; they must be hoarse by the time they return home in the evenings. On Sunday morning Wynford came round and gave us an enormous collection of videos, mostly Sherlock Holmes, Poirots and Agatha Christies. They have replaced these as they do not have a video player now. This will cause Mas to go through his collection, weeding some out so that the new ones can be put away, in the meantime they are stacked up in the sitting room. We then drove up to Robert's house, and before long we were headed off to the airport to meet Tania as she arrived. Once at the airport we had a pizza snack and drink while we chatted until Tania arrived. Robert drove back home, and we stayed for a chat and tea. Tania has bought a karaoke machine which she wants Robert to set up for her. She showed pictures of her family which seemed to be full of laughing children and sunshine. but I am not really a fan of gritty northern realism. I went off for a short walk this morning, and could not seem to settle down to all the things I should be getting on with. As planned Robert came down to us early in the evening, and we went off again to The Man in the Moon as it was their curry club evening. Luckily we were early enough to get a booth to ourselves, and immediately the place filled up with customers. Before long Ken came in and joined us, and we had dinner and chatted, with many laughs, till 11.30pm when we all left to go home. The cat woke me at 5.50am this morning, and I felt quite tired all day. The weather was depressingly grey and drizzly. I called Pete briefly, then listened to a Jeeves and Wooster on the radio. Later Toby called and chatted as he has returned home after visiting Alex in California. I watched 'Coast', and later Mas and I had a G & T to cheer ourselves up after such gloomy weather all day. Today the cat was due to have a worm pill, so I cut it into quarters and cunningly inserted them into his treats. Salty ate the first one, neatly spitting out the quarter of the pill, and regarding the rest of the treat with suspicion. Mas had to hold Salty, and I managed to drop the pill pieces one by one into his held open moth and down his throat; I was so surprised that this strategy worked! Mas cleared out the garden shed today, at last we can walk in without having to climb over things. I spoke to Pete and found his hospital appointment had been cancelled. We talked about the Skelly illustrations he would like; I will try to do them soon. I did all kinds of boring necessary things and then went for a short walk. In the evening I watched 'Coast' which I find interesting. In the evening I listened to the first of three programmes about the wonderful Jacques Brel, and they played lots of his music too. The song 'ne me quitte pas ' has a lovely phrase in it expressing that he will be less than the shadow of a dog if she leaves him. On Sunday I did not do very much, except colour my hair with 'Mahogany' which came out an unlikely shade of red. Pete phoned and chatted. I had been listening to radio 3, Late Junction, where they played a traditional song by 'Sark Voices' sung in Sark French. I had not known before that Sark had its own patois which is now almost extinct. Today it was warm and sunny for a change and I did some gardening. It was nice to be pottering about outside despite being ambushed and pounced upon by Salty. He seemed to have gone completely batty seeing me doing things in the garden again and kept running up and down trees. In the afternoon I sat with Mas and we watched a new series called 'Missing' with Pauline Quirke in it, but I found it rather annoying and dreary.afterwards I went for a walk around Stanmore; it is odd how so many of the roads have now become 'private' with 'no entry' signs up everywhere. A sign of our troubled times I suppose. I put the new 'spot on,' that we had bought from the vet, onto Salty before leaving with Mas who was going off to do some shopping. 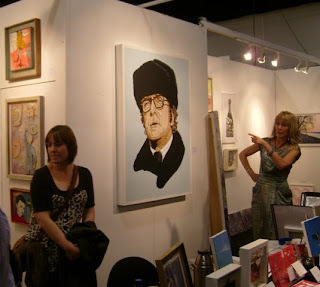 As I had another exhibition ticket I had arranged to go back to the Affordable Art Fair with Diane, for a day out together before she goes off to Normandy for a while. After a difficult and slow journey, and because several of the underground lines were closed today,I had to take the bus, and after a roundabout journey I got to Sloan Square. 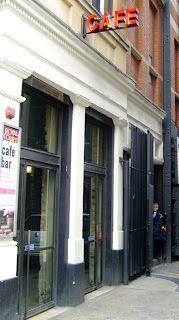 I had told Diane about the Oriel, and so we met in the cafe bar of the Royal Court Theatre and had a glass of wine before going off to the art show. We walked about looking at the art for a few hours, and I had the chance to talk to one of the gallery people about painting watercolour on a gesso primed board or paper, which was useful. After a while Diane suggested that we go to the Civil Service Club for tea as she is now a member, and after another long and noisy bus journey we got to Trafalgar Square and walked to the Civil Service club. We had some Earl Grey tea and chocolate cake and talked for a while. Diane will be leaving for France at the end of March. Afterwards we walked to the station and managed to get a train back to Edgware without changing trains. Today we were going to The Affordable Art Fair at Battersea Park, so we took the train to Sloan Square to meet Pete in the Oriel. 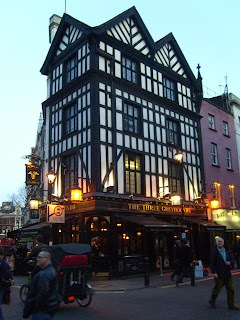 We could not believe that the Oriel, one of our favourite haunts, has closed down due to the recession after 25 years. This is odd as the place was always busy, with the restaurant upstairs and the hidden away bar downstairs! 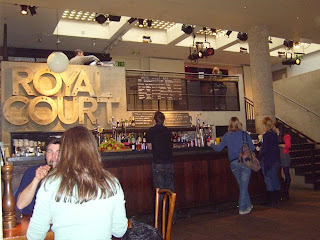 We sloped about disconsolately for a while, but eventually went to the bar cafe of the Royal Court Theatre, almost next door to the Oriel, hidden down the side. After a second restorative glass of wine and a modest snack, the surroundings looked less dusty and drab. We went around the corner and took the courtesy minibus to Battersea Park. We looked at the artwork which is always enjoyable, and halfway through the exhibition we sat down for a while and had some sparkling water to drink, and more chat. When we all felt thoroughly tired we got the courtesy car back to Sloan Square and thus back home again. A nice but tiring day. This week I spent a lot of time researching things, and sorting out direct debits. Boring but necessary. I called Margaret and talked to her for a while, and I spoke to Pete as well. On Wednesday Mas and I went off to the Man in the Moon for lunch, only to find out when we were going to go home that the power steering in the car had gone wrong, and it was difficult to manoeuvre out of the car park. Mas dropped me off and I walked home with the milk we had bought, and he drove down to our local garage which luckily is within walking distance. The garage called later, saying that they may be able to part exchange something, if it was in good enough condition, also that the fan belt had gone as well. The car should be fixed tomorrow. Today the garage called, the car was fixed, and for £100 less than we had expected. We cancelled the vet appointment as Salty is completely back on form now, but still taking the pills. In the evening Robert picked us up, and we went, as planned, to The Man in the Moon as it was the evening for their Curry Club. When we went in all the tables and alcoves were being used, and we wondered if we would eventually get a table. While we were dithering we were invited to join someone sitting at a table as there were three available seats. In no time at all we were all four of us chatting and having an interesting time as well as a tasty meal. His name is Ken (from Kenya). We did not stay too long as Robert had to go home and work. On Saturday we went off to St. Albans and met Tania and Robert at the Waterend Barn pub for lunch. We has a good time chatting; Tania is off to the Philippines on Monday for a few weeks, and there was a lot to talk about. Afterwards we got some shopping from the market and went home, and relaxed for the rest of the day. Salty seems much better, and loves his antibiotic pills and thinks they are special treats for him. On Sunday we did our usual chores, relaxed and I went off for a walk just as the weather was turning colder, just for the exercise. Today I went off to Old Street Station and met My brother Peter. 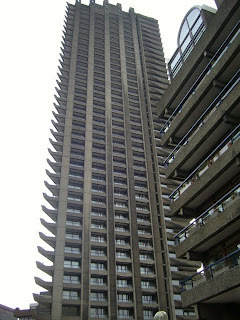 We walked off through the city towards the Barbican. Peter pointed out these grim looking flats to me saying it was the highest residential block in London. 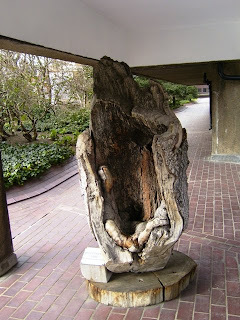 This 'sculpture' is a 500 year old tree, under which it is said Mendelssohn sat while he wrote the music for A Midsummer Nights Dream. The highest London residential flats. We walked through to the Museum of London ;I had never been there before, and in fact did not even know it existed. 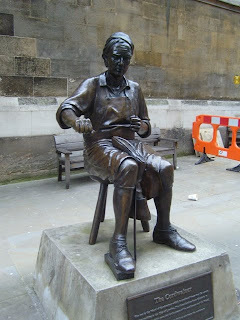 The display began in in London's pre history showing flint cutting tools and worked it's way through to modern times. There were lots of French schoolchildren looking at things. The displays were very good, showing the kinds of rooms that people would live in during different ages, the food they would have eaten, and all the artifacts of their lives. Some of the displays were interactive which the children enjoyed. We worked our way through to Henry V11 times, by which time I was exhausted, and suggested we do the rest on another day. 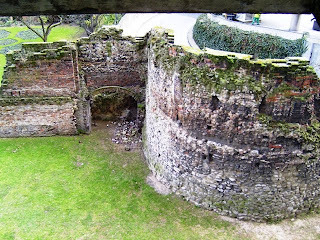 This is part of the London Wall which is visible from the museum, which was begun around 194AD, if I remember correctly, and was added to and changed over the centuries. Once we left, we went to the Watling Street pub and had a drink and chat until we got our walking legs back again, and Peter bought some exotic sausages from a bespoke butcher. 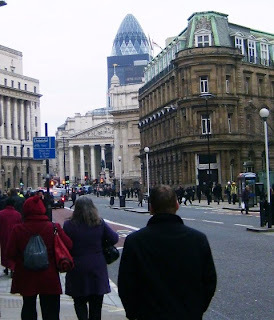 We walked off towards Trafalgar Square and took the tube home in different directions. By the time I got home I was happy to sit and watch TV for a while, but I had enjoyed the outing with Peter. Yesterday I put some Frontline spot on onto the cat as it is now time to do him again. It got very cold in the evening, and Salty spent quite a bit on the night indoors. Today I noticed that the cat seemed to have lost fur on his lower stomach, and that the skin was very red, so we made an appointment to take him in to the vet early in the evening. I had ordered some cat food and some of the usual Frontline spot on earlier in the week, and that arrived today. I walked down to the library as the weather was bright before taking Salty to the vet. We tried a new, closer, vet today, but Salty was still very stressed even by the shorter car journey. 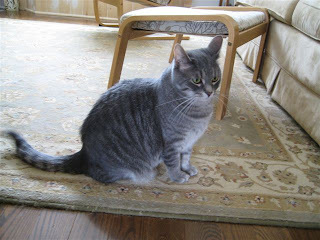 The vet, after examining him, said that he had an allergy to flea bites, and although we had been using 'spot on' it was not working for him, so we have to use a more expensive one as the fleas in our area seem to have become resistant to the usual one. She gave him a quick injection of antibiotics, and we got more pills to give him tomorrow to start a course of antibiotics. After this consultation Salty got back into his carrying box, which surprised us because when we tried to put him in it earlier he had held onto the doorway with his arms and legs; he knew it was the only way to get home again, and he was ready! This short visit cost another £80.00! The good part was that he seemed to begin feeling better almost immediately. I vacuumed and sprayed the house, and washed all the covers that he normally sleeps on. Florence had called earlier, so I phoned her and talked for a while, and spoke to Diane too. Yesterday we spent time doing comfort cooking: rock cakes, (unfortunately they got a bit overcooked so turned out as the kind of cakes visitors would hide behind cushions to avoid eating them in case they broke teeth,) soup and shepherd's pie (without adding a shepherd). This last, reminds me of Mason's mother: she had a statuette of an organ grinder with a monkey who was holding out a hat for the money. When visiting her one day, she asked if we had seen her monkey grinder which made Mas and I snicker more than somewhat, until she lost patience with us. and twins are born in France. It was sunny and bright in the morning which was cheering. Both Mas and I seemed to busy all day, but I did go for a walk as it began to get dark. I enjoy walking through the streets, and as I pass brightly lit rooms I wonder about the people who live in them; it is like viewing stage scenery from the anonymous darkness. I was rather puzzled as some of the homes seem to have wall sized TV sets which were on and displaying a variety of happenings, but the rooms were empty, and no one was watching. Salty seems rather off colour still, so we decided not to give him any more treat snacks in case he had an alergy to them or something. In the evening we watched the Holcroft Covenant with Michael Caine, neither of us had seen this film before so that made a pleasant change; it was based on a book by Robert Ludlam. 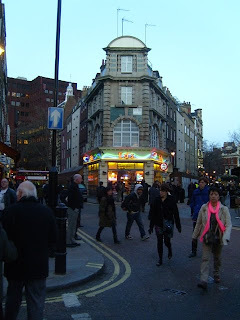 Today we went into London to see the Jersey Boys musical which is a present from Romy and Toby. We had to get there a little early as we had to collect the tickets from the Box Office first. 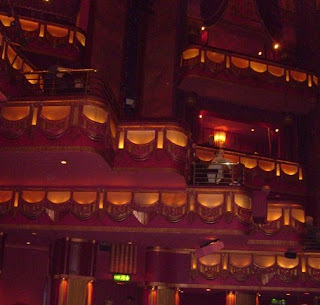 The people at the Prince Edward theatre were very nice. After a quick drink at the bar we found our seats, which were well placed with a central view. As it was a matinee performance the audience were largely elderly folk who did not have to spend the afternoon working. 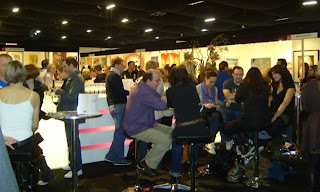 The atmosphere was very good. 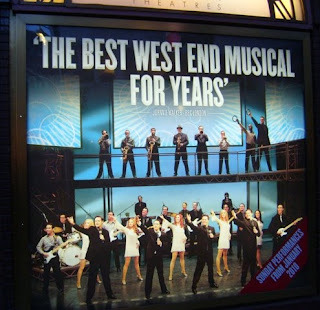 The performance was outstanding, the actor palying Frankie Valli had an amazing voice. All the cast performed really well, the dancing was excellent, and there were a few light touches of humour. The scenery was effective, and the lighting set the mood for each scene. We both really enjoyed it, and it bought back memories for Mas of listening to the music while driving. It was very inspiring to see how hard everyone concerned in this production has worked to make the show so good. At the end of the show the audience gave a standing ovation to show their appreciation. And we had a glass of wine; Mas said he needed one to gain his eqinimity again. We then had dinner. I have a new plan which is to have a starter, no main course, and then to have a dessert. Mas is following the traditional plan. We went home on the underground, and Mas avidly read the programme while we travelled and was surprised when we reached Edgware so soon. What a day to remember!